Two F-16 fighter jets intercepted a plane flown by a 75-year-old woman after it entered restricted airspace during President Barack Obama’s recent visit to Chicago, federal officials said Thursday. The North American Aerospace Defense Command told The Daily Herald that the jets were summoned when air traffic controllers couldn’t contact the pilot Wednesday afternoon. The president was in Chicago for a fundraiser celebrating his 50th birthday. 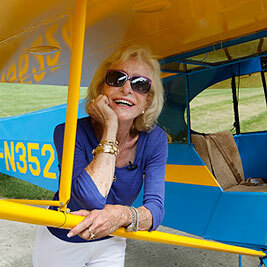 The jets intercepted the Kitfox Model 2, a kit airplane, piloted by Myrtle Rose of South Barrington, a Chicago suburb. Rose turned the plane around and returned to Mill Rose Farm Airport, NORAD spokesman Lt. Michael Humphreys said. Rose’s plane didn’t have a radio, which forced NORAD to use the jets to identify and intercept the plane, Humphreys said. The pilot met with local authorities, Knott said. The Federal Aviation Administration is investigating. Rose didn’t appear shaken after the incident, Deputy Police Chief Ray Cordell said. “She was unaware that she had entered restricted air space,” Cordell said. “Surprised was probably the right term.” Calls to a listing for Rose in South Barrington rang unanswered Thursday. The town, home to about 4,500 residents, is outside of Chicago. “We do not have fighter jets flying over the village very often,” Cordell said. Posted on December 20, 2012, in Aviation. Bookmark the permalink. Leave a comment.